For people who spend their work days sitting at a computer, or truck drivers who spend many hours on the road, one occupational hazard associated with some of the most common jobs is back discomfort, particularly upper back and neck pain. The question of how to relieve back pain is most commonly answered with medications or massage. However, prescription and even over-the-counter medications can have short and long term side effects, and massages only provide temporary relief, if any at all. One new potential alternative treatment for neck and upper back pain relief is whole body cryotherapy. It’s less well known that other alternative treatments like acupuncture, but when compared side by side, the use of cryo treatment for neck and upper back may be a superior solution to the needle based ancient remedy. Acupuncture is an ancient method for pain management. It’s so widespread that many doctors now recommend it and some insurance plans even cover it. Documented results have shown that acupuncture for arthritis sufferers can help reduce their pain, and the procedure is even touted to have psychological effects like helping people quit smoking. However, while the ability to change the way the nerves perceive pain has been documented in some individuals, acupuncture is not yet widely used for upper back pain relief. It’s also expensive in some cases, and for those with a fear of needles, simply not an option. Aside from these pitfalls, there are side effects associated with acupuncture. That’s right – while normally considered safe, it’s not a complete no-risk back pain solution. Bruising, soreness, fatigue, muscle twitching, lightheadedness and even worsening of symptoms can all occur as a result of acupuncture. Unlike the multi needle form of treatment for neck and upper back pain relief, there are virtually no side effects associated with using a cryotherapy cold sauna when used correctly, under supervision and in the presence of no cryotherapy contraindications. Individuals with heart and kidney conditions cannot use whole body cryotherapy, and there are some health conditions that can make cold therapy unsafe. However, for otherwise healthy individuals, no adverse reactions are expected, already making it a potentially superior choice over acupuncture. Relief comes initially from the slowing of pain receptors in the nerves. 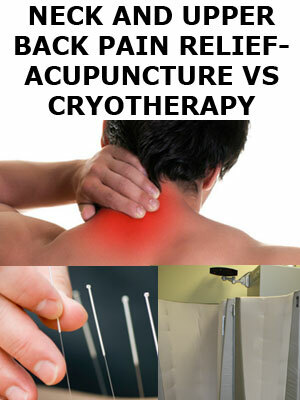 They are hence slower to tell the body to respond to the sensation of pain, thanks to this slowing deep freeze. Secondly, upper back pain relief can be had thanks to the body’s release of norepinephrine, a substance the body uses to reduce pain and keep us going in stressful situations. Lastly, whole body cryotherapy contributes to the reduction of inflammation, a hallmark of pain management. And the results are documented via clinical studies. Decreased inflammation can greatly reduce pain and in affected individuals, providing neck and upper back pain relief. Whole body cryotherapy is not an instant fix, and most people require numerous sessions to yield long term benefits. Our customers at Cryotherapy Health And Wellness Inc. typically start noticing health improvements within the first few sessions, with more noticeable results achieved upon the completion of a full package of 10 or 15 cryo treatment sessions. Priced at only $500 and $675, respectively, these cold therapy procedures are often more cost-effective and time-efficient than acupuncture. Over time, our users find longer term pain relief that can make daily activities easier and more comfortable without the risk of side effects from medications and other alternative treatment methods.